This week I finally made it to a craft fair!!. My first ever public event selling my work. It was a huge step, inspired mostly by this modules push and some close friends who more or less dragged me there. 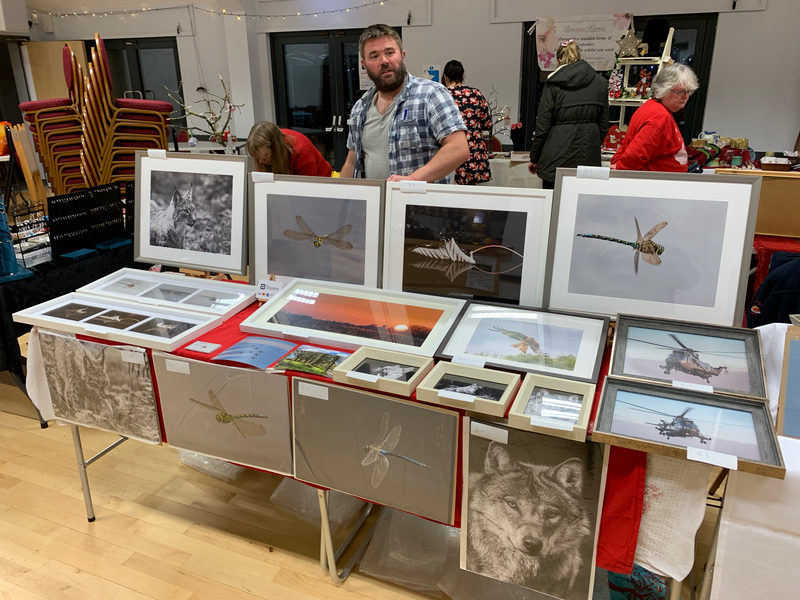 The Kingsbury Christmas Fair ran on Saturday evening and was an amazing rollercoaster ride for me. The development work for the fair started some three weeks before. I wanted to make sure I had a portfolio of images that would have a high impact, whilst also adding other images as experiments to see what would draw in interest. I didn’t expect to sell anything, rather I wanted to do this for my own confidence and to see public reaction to my work. In the end, I picked some 25 images from a selection of around 1800. I followed some of the learning from my MA and attempted to get as good a cross-section of my work as possible. I knew families, kids and couples would be going, so I tried to ensure I had images for all of these markets. This was more challenging than I first considered. In the end, I had over thought the whole thing and just so decided to just go with what I felt would work. I then had to look at framing. I struggled to find a supplier of card mounts and packaging, I had wanted to have a handful of framed images, along with a couple of box mounted sets in card mounts. I had been told by other photographers in the past not to frame all my pictures, as some people like to buy them unframed and do that themselves. As time was getting tight and money even tighter I decided to look at frames from highstreet sources. I found what I needed in the Range, Dunelm and IKEA. The latter providing frames with plastic, not glass – this made me feel more relaxed around safety. I had size my images to fit known high street supply. I had also looked to do a mixed size of images to support the idea of widening my market as far as I could. I loaded them all into the car and journeyed across to the show. The show started at 6pm. I was there from 2pm. It took me three hours to get everything unwrapped and set up. I learned a number of lessons on how to wrap images up, use of bubble wrap and ensuring you have proper pricing labels. But for tonight, it was very much make do. The table wasn’t large enough for all my images, but a friend helped me build a contraption to hold them. Basically a plank of wood with a crossbar and clamps that meant I could stand images up at the back of the display. In the end, it was all set up and ready! The show opened at 6, but at 5:30 I sold my first print. A dragonfly, taken earlier that summer. I was actually in shock, much to the amusement of friends. Once the show opened it was very busy very quickly. I was blown away by all the positive comments and feedback I had. People would gather and look at my work and talk about it. Sales started to happen and very quickly I had sold five, then ten images. I had to work hard to keep up. I learned a lot. The images needed wrapping once sold, but the system I was using failed miserably and I had to get help from the stall next to mine. There was literally bubblewrap everywhere. In some cases, my pricing was too low and that was pointed out on a number of occasions – which was a surprise also. After two hours I was done. Of the 25 images, I had sold 18. My leaf images and the big none framed prints didn’t sell. The latter largely as no one could see them hanging off the table. One of the most surprising reactions was with an image of the Lynx I had taken at a local wildlife park. Framed in a silver frame and of a size around 18inc by 12, this image got the most attention but interestingly didn’t sell. The leaves were received very well, despite not selling, with one attendee saying they should go to a gallery and be sold there. I was surprised yet happy with that. In all, it was a very worthwhile experience and one that has really pushed my confidence to a new level. I am now starting to see my practice as a viable commercial business with potential. One that only my confidence (or lack of) holds back. I am now looking to raise the money to invest in more prints, frames and a much better system to sell them with. I am now looking forward to the next chance to sell my work, only this time I will be ready for it.